Birding Is Fun! : Breeding season already? Sure, the Great Horned Owl chick is already quite large. The Anna's Hummingbirds are working on their second batch of young, the Canada Geese and the Bald Eagles are incubating their eggs. Three years ago I photographed a Killdeer on a nest only a few hundred feet away, here in Forest Grove, Oregon. But that was late April. But it is only March 23rd, surely the Killdeer feigning the injury to draw me away isn't nesting already, is it? Killdeer would seem to choose very poor nest locations: the center of a gravel road, the bark-dusted landscaping in the middle of a shopping mall parking lot. Yet, the numbers and wide range of Killdeer would indicate their success. It helps that they lay large eggs and have precocious young--the chicks leave the nest the day they hatch and seek better protected locations under the care of their parents. Yep, there it is. Amazing! Greg, it is amazing that so many Killdeer chicks survive considering how the adults often make nests in such poor locations where there might be heavy human traffic. But they do well despite that! Y aquí empieza otra generación, excelentes tomas, bonito trabajo. Thanks Salvador. Your comments are appreciated. I've seen many a Killdeer nest tragedy because of the choice of real estate, but I've seen far more successes than failures. I wonder if the mother Killdeer learn from their nest location mistakes and choose more wisely for future nests. ??? Cool! 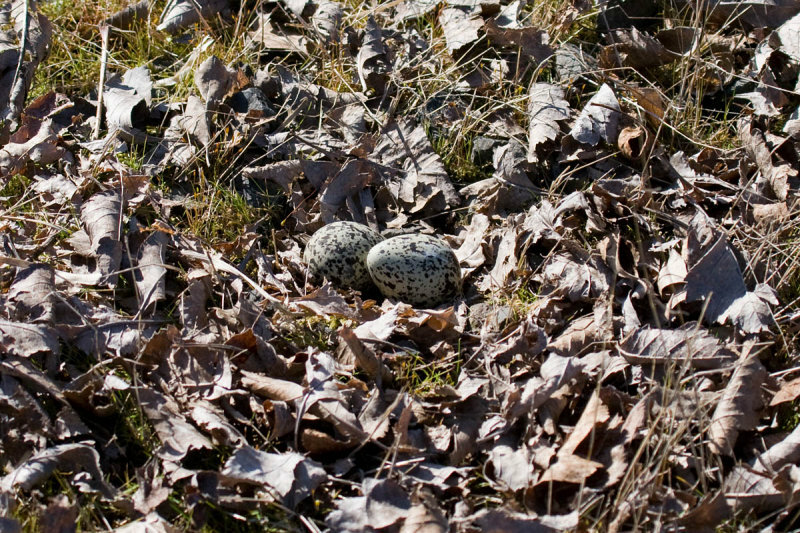 You know I see plenty of Killdeer but have never looked for the eggs. If you get the chance, Larry, I strongly recommend helping out with a breeding bird atlas. These multi-year projects look for any sign of breeding activity, from pairs of birds in suitable habitat, to nests. Oregon did their Atlas 1995-1999, but I miss it, and I still find myself seeking breeding confirmation when I'm birding in spring and summer. amazing what they do for distracting you from the nest!! and that they put eggs in a so accessible place.. thank you for explaining, your pictures are great like always!! last week people told me there was a migrating stork, not far from here. I wasnt quick enough she continued her journey before I went there photographing.. I've already seen baby Killdeer this month! Granted, Im in San Diego, but it still seems early. I've also seen Horned Lark, Mourning Dove and lots of Snowy Plovers on eggs at the beaches. 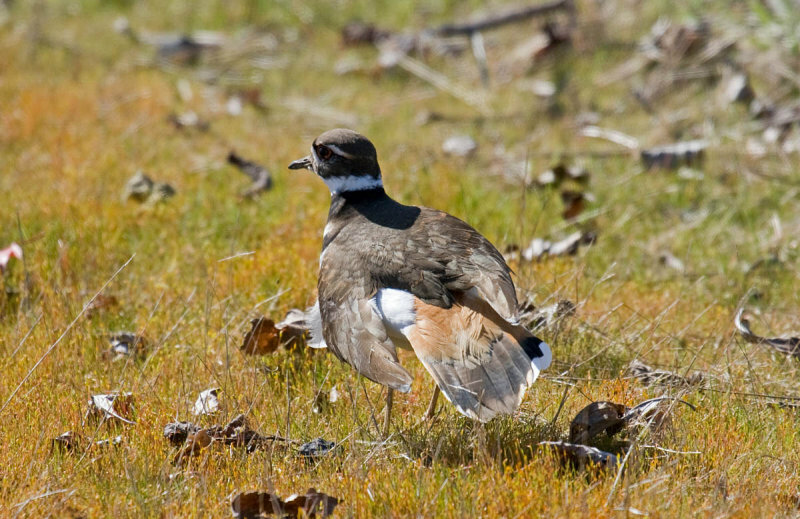 Killdeer are really neat birds. I love their broken wing act. I have never seen the eggs before ... very pretty. Kildeer must be closely related to the African Dikop who lay 2 eggs in the middle of stony terrain: when we lived there, we had a pair nesting in the middle of our drive way! Nature seems pretty early in France too this season.